Marines could be training in the Corps' next-generation simulated marksmanship trainers as early as June will begin hitting the fleet this June, and they’ll provide leathernecks with new levels of hyper-realistic options to prepare them for real-world missions. 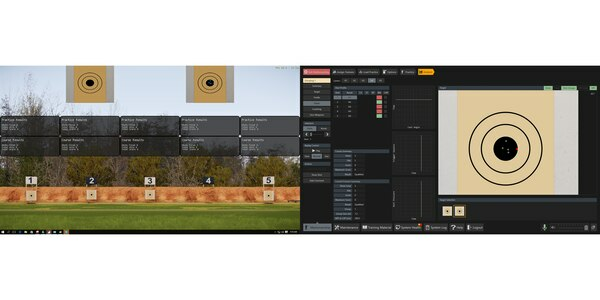 On Feb. 23, Marine Corps Systems Command recently placed a third order for $5.8 million towards its the new Indoor Simulated Marksmanship Trainer, bringing the service’s investment in the system to $25 million out of its current $32.7 million contract with Meggitt Training Systems, Inc. 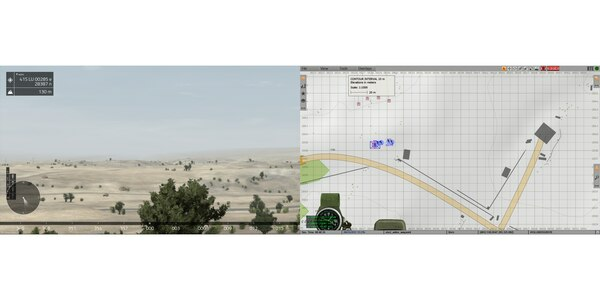 The drastically improved system will integrate teams and individual Marines in a 3-D world where new weapons systems, accurate ballistic arcs, indirect fire and realistic environments will challenge them across a range of "shoot/no-shoot" judgment calls and tactical and marksmanship scenarios, according to SYSCOM officials. "It’s a new virtual world that you’re firing into; it’s no long static pictures," said explained Col. Walt Yates, SYSCOM program manager. "It’s much more like a first-person shooter video game for the tactical scenarios, where you have [events] happening in front of the shooter with dynamic environments." The Marine Corps will begin fielding its new high-tech Indoor Simulated Marksmanship Trainers in June. For the first time, the ISMT will include new weapons like such as the M27 infantry assault rifle, the M32 multiple grenade launcher and the M72 light anti-tank weapon. Up to eight Marines at a time will be able to conduct day or night - deliberate and hasty attacks, combat and reconnaissance patrols, meeting engagements or raids. They’ll be able to do so over mountains, deserts, forests or cities; on glaciers, volcanoes, oceans, beaches or grasslands. "Something we've never had before is the ability in simulation to say 'ok, we're going to train for a first light of dawn engagement, and this is what the illumination is going to look like," Yates said. "The new ISMT will accurately reflect the illumination and the shadows that you would have on that specific piece of ground." The Corps' new Indoor Simulated Marksmanship Trainers can be adjusted to mimic certain times of day or night. The new ISMT's core feature, however, is something Marines have been doing for generations: honing the basic fundamentals of marksmanship. Since ISMTs first hit the fleet in the early 1990s, they’ve been used to prep Marines ahead of live-fire ranges or offer remedial training for those behind the curve, said Sgt. Brandon Harris, a primary marksmanship instructor with Weapons Training Battalion in Quantico, Virginia. Through the battalion's WTBN’s M marksmanship training company, Harris provides marksmanship instruction to about seven companies of lieutenants each year as they complete lieutenants per year coming through the Officer Basic School. "We use [the ISMT] mainly for remediating shooters who have an issue," he said. "If we feel they're struggling a little bit or they're just not reaching the curve, we'll bring them in and give them more one-on-one instruction. It's probably our biggest tool for that." Harris said he's eager to use the newest iteration of the ISMT. Its immersive high-fidelity sound and visuals will help close the gap between the inherent limitations of an indoor simulation and the real thing, he said. "The more realistic we can make a training environment, the better it will prepare Marines for actual situations," Harris said. "The better the technology, the better the training." The fielding of the new ISMTs is in line with a push throughout the Corps for greater use of advanced technologies in training, driven by the commandant. In January, Gen. Robert Neller emphasized the need for virtual training environments across the force when he released a fragmentary order to the 2015 planning guidance of his predecessor, Gen. Joseph Dunford. "Enabled by technology, we will increase the amount of training each unit can accomplish — to 'increase the reps' in mentally and physically stressing environment for all elements of the [Marine air-ground task force] before they do so on the battlefield," he said. In the FRAGO, Neller expanded on Dunford's specific guidance on using simulators. "I expect all elements of the MAGTF to make extensive use use of simulators where appropriate," Dunford wrote. "My intent is for Marines to encounter their initial tactical and ethical dilemmas in a simulated battlefield vice actual combat." The shift towards tech-savvy simulators comes as the Marine Corps faces the end of its years-long drawdown and significant budget constraints, even as the service takes on expanded mission sets around the world. 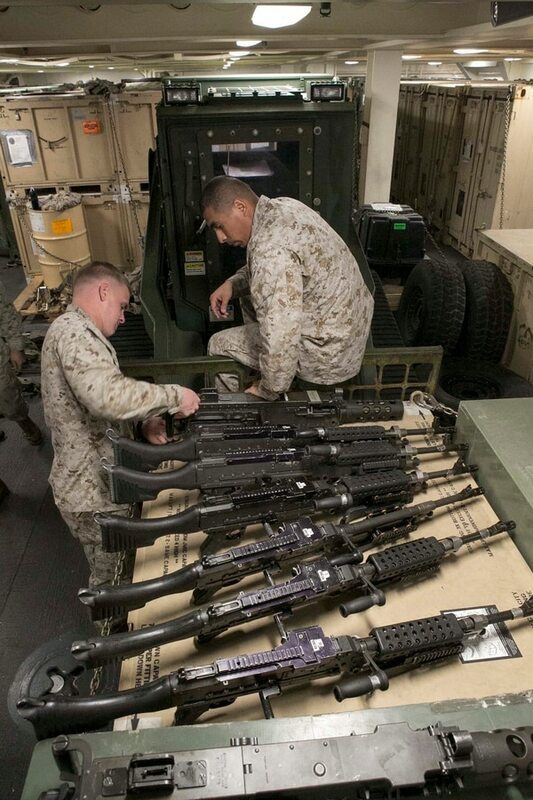 This means that when a Marine steps up to the live fire line, there is a greater need for him or her to have as fine a handle on marksmanship as possible before rounds, sweat and wear and tear on vehicles and weapons are expended. They should be ready to learn at a "graduate level," already having a high degree of mastery over marksmanship fundamentals, Yates said. "Simulations are very effective and inexpensive to acquire that level of skill," he said. "That's the role of simulation-based training: to prepare you for live training." The ISMTs are not, however, simply a means to cut back on the beans and bullets needed to master involved with learning marksmanship. It can be a Marksmanship is a perishable skill, and Marines across the fleet often find themselves in places where live-fire training is either impossible or highly impractical, such aboard ships or at embassies. ISMTs allow Marines to keep training keep up their skills. Members of Battalion Landing Team, 2nd Battalion, 6th Marines assemble a .50-caliber machine gun during a gear inspection at sea. 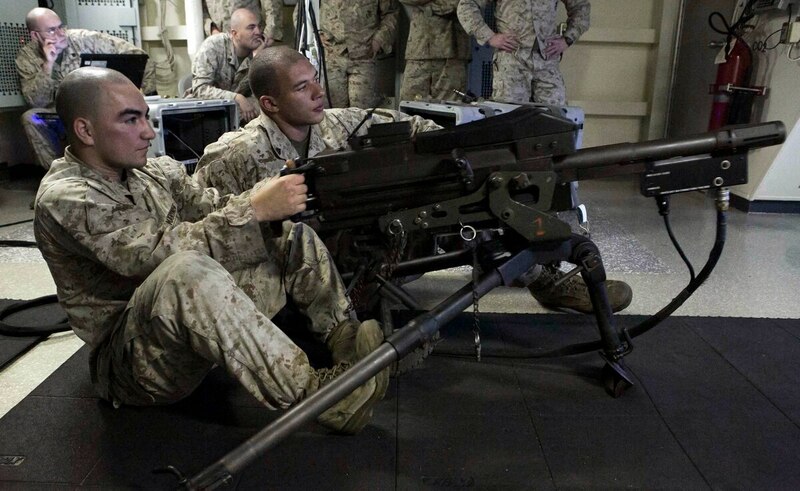 Marines will soon be able to use Indoor Simulated Marksmanship Trainers at sea. ISMTs are currently aboard seven out of the 10 current San Antonio-class amphibious transport dock ships, and expanded funding is in the pipelines to outfit 50 additional U.S. embassies with the new system, according to Bill Fondriest, former ISMT project manager for SYSCOM. The systems are meant to supplement live fire training, not replace it, he said. "As long as live fire ranges are available, Marines can and should train with live fire," Fondriest said. "But the question becomes 'what do you do when either budget or physical constraints restrict live fire?' You either train using simulation or you don't train at all, and that's the gap ISMT tries to close." Once delivery begins in June, the ISMTs will be fielded at a rate of about 50 systems per month, up from an initial contract for 15 to 18 per month, Fondriest said. "We estimate that once we start delivery, we could effectively retrofit the entire fleet between 14 and 16 months," he said. The 'indefinite delivery, indefinite quantity' contract with Meggitt Training Systems, Inc. currently calls for a total delivery of 670 systems worldwide.